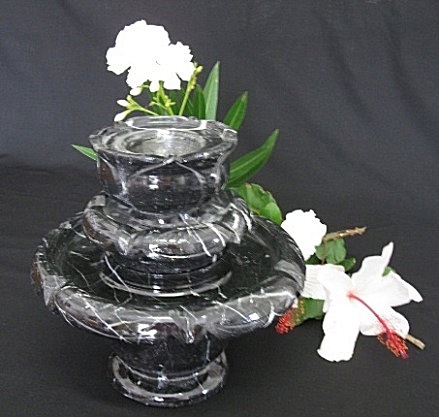 Tier style water fountains carved from single blocks of marble, granite. Magnificent cascading water over 2 tiers, combines the elegant simplicity of Japanese style with contemporary design. The white coloured vein over black marble elicits a response similar to viewing ocean waves or sitting beside a mountain stream. The movement of water over granite tiers brings the stone alive, creating a soothing, contemplative atmosphere This stylish work of art can adorn your office or home.